At SJV we don’t discard past styles of play and learning but we recognise the feauture to which our students belong. It is an exciting time and we have a responsibility to ensure our students have the capacity to navigate the world with the skills, values and disposition to contribute positively to the community and the future. That world is a largely digital world. 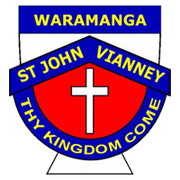 St John Vianney’s is committed to developing children’s ICT skills with a computer lab, computers in the junior and senior wings, Interactive Whiteboards, and tablets and laptop computers for use by both teachers and students in every classroom. SJV has Bring Your Own Device (BYOD) for students in Year 5 and 6, policies and guidelines apply. At St John Vianney's Cyber Safety is in place. On all Catholic Education School networks non-educational websites are blocked aswell as those that are known to contain inappropriate content. This is enforced when children access the designated BYOD network. Education, however is the key. We constantly teach the children what it means to be a good digital citizen and what they should do if they encounter suspect websites.